April 7th - Sunday:: House Concert with songwriter and singer, Karin Blaine, in the Attic at 314 East 2nd Street in Moscow, 7:30 PM. Admission by donation. It’s been ages since we've had a show in the Attic. Maybe even a year or two. We're excited to be hosting a show with Karin Blaine on Sunday April 7th at 7:30 pm. With one voice and one guitar, Seattle acoustic artist, Karin Blaine, sings her richly poetic songs and delivers a unique take on being human in the modern world. Karin leads her listeners through the stumbles and wins of modern day living with wit, charm and heart. Hers is an entertaining ride. Blaine has performed at festivals and clubs including Seattle's Bumbershoot, the Northwest Folk Festival and numerous clubs around the country.. She was honored as a New Folk Songwriting Finalist at the Kerrville Folk Festival in 1991 and her original songs were included on the regionally successful KEZX FM Seattle Album Projects I & II in 1983 and 1986. She is currently performing and touring throughout the greater Northwest with plans for a new recording in the fall of 2019. Check her out at www.karinblaine.com/. April 13th and 27th -Saturdays: SLOW JAMS (Second and fourth Saturdays) from 1-3 PM 314 East Second St. attic (up the long driveway and up the back stairs.) For any interested folk musicians All experience levels welcome, including raw beginners. We may go over a piece more than once. Bring music or chords if you have them and share a little of what you are working on. There will not be an audience. We just go round in a circle picking a favorite tune, and others try to join in. Perfection not even considered! Come join us. 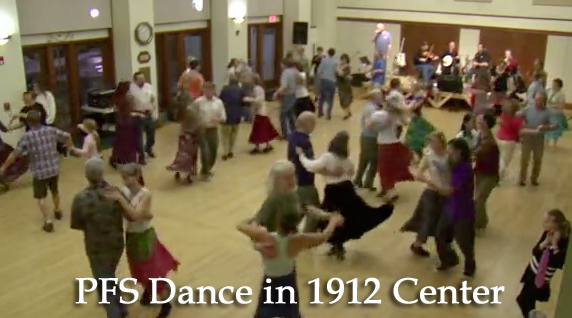 March 20th: Saturday: COMMUNITY CONTRA DANCE with music by Under the Wire and calling by Nora Scott, at the 1912 Center (Corner of 3rd St and Van Buren in Moscow). 7:30 PM. We have an excellent band to drive the dancing for the evening. Under the Wire is made up of John McInturff on fiddle. A long time staple of contra dance bands in this area. You've heard is masterful fiddle playing with the Hired Hands band and more recently with Coyote Hill; amazing multi-instrumentalist, Greg Hodapp, will be playing banjo, concertina and perhaps some whistle this time around; David Christian from Captain Ludd's Rant and Barefoot Saturday will provide the rhythm guitar; and holding everything together on bass will be Doug Park, veteran of Captain Ludd's Rant, Henry C and the Willards, Tom Drake and Undiscovered Country and numerous other bands over the years. Nora is one of our favorite callers from Spokane, so you know that it will be great fun! Nora is wonderful with newer dancers, so bring all your friends and relations along to share in the experience. Great music and lively dances to keep your feet moving! Beginner? No problem- Arrive at 7:30 and there are free lessons. April 7: House Concert with songwriter and singer, Karin Blaine, in the Attic at 314 East 2nd Street in Moscow, 7:30 PM. Admission by donation. April 20: Contra Dance with music by Under the Wire and calling by Nora Scott, at the 1912 Center, 7:30 PM. May 3: Renaissance Contra Dance with music by Wild Sage and calling by Logan Creighton, at the 1912 Center, 7:30 PM. May 4 and 5: 46th Annual Moscow Renaissance Fair, East City Park, dawn to dusk, relatively. May 18: Contra Dance with music by Red Herring and calling by Joseph Erhard-Hudson, at the Old Blaine Schoolhouse, potluck 6:30, dancing 7:30 PM. June 15: Contra Dance with music by Arvid Lundin and Deep Roots and calling by Nora Scott, at the Old Blaine Schoolhouse, potluck 6:30, dancing 7:30 PM. July 11: House Concert with fingerstyle guitarist, Dorian Michael, in the Attic at 314 East 2nd Street in Moscow, 8:00 PM. Admission by donation. July 20: Contra Dance with music by Paul Smith and Alex Roberts and calling by Erik Weberg, at the Old Blaine Schoolhouse, potluck 6:30, dancing 7:30 PM. August 17: Contra Dance and Pie Extravaganza with music by Under the Wire and calling by Gary Miller, at the Old Blaine Schoolhouse, potluck 6:30, dancing 7:30 PM. September 21: Contra Dance with music by a groovy band and calling by Nora Scott, at the 1912 Center, 7:30 PM. October 8: Concert with songwriter and singer, Bill Staines, at the 1912 Center, 7:30 PM. October 12: Contra Dance with music by Paul Smith and Alex Roberts and calling by Nancy Staub, at the 1912 Center, 7:30 PM. October 26: Halloween Contra Dance with music by The Acrasians and calling by Pat Blatter, at the 1912 Center, 7:30 PM. November 16: Contra Dance with music by Red Herring and calling by Nancy Staub, at the 1912 Center, 7:30 PM. December 21: Contra Dance with music by a groovy band and calling by somebody cool, at the 1912 Center, 7:30 PM.